Turkey increases the aid it provides to UN agency for "Palestinian refugees". The Turkish government on Thursday announced the transfer of an additional $10 million to fund the activities of UNRWA, the UN’s agency for “Palestinian refugees”. 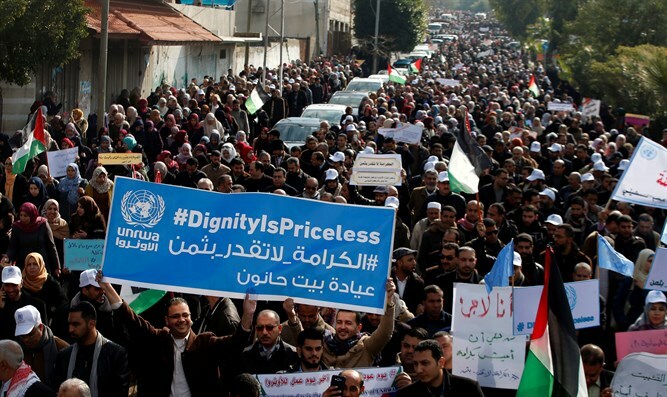 The Turkish Foreign Ministry said that the aid is intended to help UNRWA deal with the financial crisis it is experiencing which, it said, is harming the education and health services it provides to the Palestinians. UNRWA's assistance is granted to Palestinian Arabs who have been defined as “refugees” since 1948 and their descendants without any time limitation. In addition, Turkey increased the amount of flour it supplies to UNRWA to 26,000 tons and allocated $1.2 million to the World Health Organization for the treatment of Palestinian Arabs who were recently injured during the Gaza conflict. The U.S. announced in January it would cut some of its funding to UNRWA, citing a need to undertake a fundamental re-examination of the organization, both in the way it operates and the way it is funded. The organization later received pledges of $100 million in additional funding from Qatar, Canada, Switzerland, Turkey, New Zealand, Norway, Korea, Mexico, Slovakia, India and France as a means of making up for the aid that was cut by Washington. UNRWA, meanwhile, is notorious for its anti-Israel activities. During the 2014 counterterrorism Operation Protective Edge, Hamas rockets were discovered inside a school building run by UNRWA.